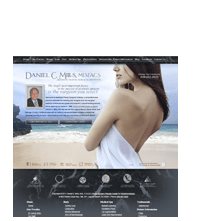 If you are considering plastic surgery and cosmetic enhancement treatment, you obviously want to know with as much accuracy as possible exactly how you are going to look after the procedure. While no technology is capable of giving you a 100 percent accurate picture of what the results can look like, the VECTRA® 3-D imaging system from Canfield can give you a very good idea of a procedure’s potential. This state-of-the-art computer imaging program shows you a 3-D, multi-angle image of your body, and makes it possible for Dr. Daniel C. Mills to modify the image to help you decide which breast surgery outcome is best-suited to your goals. With VECTRA® 3-D imaging, you can increase or decrease the size of breast implants, see the possibilities of a breast lift or breast reduction, and more. VECTRA® 3-D imaging can’t completely predict the future – but it can give you a clearer vision of the potential and make the decision process a bit easier. Please contact Dr. Mills for more information on the VECTRA® 3-D imaging system and how it can help you determine your ultimate breast enhancement goals. It’s always a good thing for patients to be very cautious and inquisitive before deciding to undergo any type of surgery. You naturally want to know as much as you can about the potential results before you set foot in the operating room, and you want to be able to compare your choices to have the most educated opinion on treatment options. With breast enhancement procedures, particularly treatments such as breast augmentation with implants, it’s important for you to be able to see how the differences in implant sizes may affect your proportions, and then, with your plastic surgeon, discuss the options that may best fit your ultimate goals. The picture of how you may look after surgery can be a lot clearer with VECTRA® 3-D imaging. The VECTRA® 3-D imaging system works by incorporating a picture of your body with medical data. Once the computer software has combined the image and the data, it creates a realistic, 3-Dimensional image of you that can be looked at from a number of different angles, and modified to show you the potential results of the procedure you are considering. For instance, Dr. Mills can show you a number of different potential outcomes based on a range of breast implant sizes. He can also show you the possibilities of a breast lift surgery, and how it may improve the appearance of your breasts by tightening the skin and lifting them into a more youthful, “perky” position. Again, the VECTRA® 3-D imaging system is a state-of-the-art technology that can give you a much clearer idea of potential results – but no technology can claim to predict the future with 100 percent accuracy, and the VECTRA® 3-D imaging system does not make that claim. What it can do is provide you with a very realistic prognostication of what could be the final result, and help you more clearly understand (and see) the differences between potential outcomes. If you would like to know more about the VECTRA® 3-D imaging system, or if you would like to schedule a consultation with Dr. Mills and see your potential results via this innovative technology, please contact Dr. Daniel C. Mills.